This week we record at the Animal Kingdom Lodge with special guest Scuba Owl. 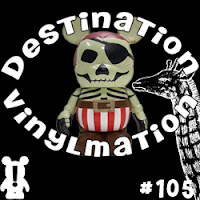 He is an avid listener and Vinylmation writer. We talk about all things vinyl and the future of the hobby. In a twist, Scuba Owl interviews us to give you the chance to learn more about us. We also deliver all the latest news and the current release calendar. Great Podcast guys,,,,,Cool to hear Scuba Owl on there with you guys on location and to learn more about you guys. Thanks, Roger! And thanks Nick and MC, I had an absolute BLAST! !